LCD eWriters are essentially an eco-friendly, paperless mashup of sketchbooks, memo pads, notebooks, drawing pads- all rolled into one cool little tech product. They use reflex LCD technology to provide a high-quality writing experience in a modern and sleekly designed package (Source). Some eWriters like the Boogie Board Sync can save several hundred pages worth of notes onto the SD memory card and then transfer those files into a smart phone, tablet, computer or some other device wireless or even through USB. Let's take a look at 5 of the best selling Boogie Board eWriters and see how they compare. The Sync has the most features (including saving and transferring your work) but the Boogie Board LCD Writing Tablet is an affordable option, but does lack the file save and transfer functionality. 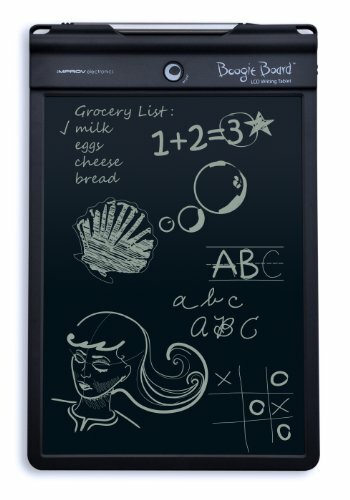 This Boogie Board eWriter measures 11.7 x .7 x 7.6" and weighs only 12 ounces. It has a 10 1/2 inch screen size and runs off a pair of AAAA batteries. It's a great way to collaborate with your children, many users write, helping them to do math problems for spelling exercises without wasting a ton of paper. Other families keep them around the house for general note-taking like grocery lists or family chore lists. It's important to note that this model does not allow you to transfer your drawings or notes from the device to a computer- you need to upgrade to the Boogie Board ﻿﻿Sync﻿﻿ to do that. In all, this is an inexpensive, highly portable eWriter that has received a great deal of praise from its user base. Doesn't actually save drawings to a computer- you need to upgrade to the B﻿﻿﻿﻿﻿﻿﻿﻿oogie Board ﻿﻿Sync to do that. Boogie Board's goal is to replace pen and paper. While they are attempting to replace this age-old industry, they are still enthusiastic about the cognitive benefits of hand writing notes rather than typing. A scientific study conducted by Princeton University demonstrated that participants who used laptops in class took more notes, but those who hand wrote notes actually ended up with a much more robust understanding of the concepts being taught than those who used their laptops to take notes. One of the reasons why this phenomenon occurred, the scientists speculated, was that because handwriting is so much slower than typing, that participants need to dwell on what they are writing as they write it rather then quickly and automatically transcribing what they are taught using a laptop. Memory tests confirm this hypothesis. The research scientists speculate that mindless and rote typing notes actually does not facilitate greater comprehension of high-level educational concepts. Pressure sensitive writing surface lets you articulate different levels of line thickness. What is a writing or graphics tablet? A graphics tablet or eWriter, technically defined, is essentially an input device used by business people and even artists to take notes onto a computer screen without having to use a keyboard or mouse. These drawing pads or writing tablets that you use a stylus-type pen or even your finger to take notes in a smooth flow. This can be great if you enjoy writing instead of using a laptop to take notes and is more inexpensive and portable solution then an iPad. These graphics tablets come in a variety of different screen sizes. Some even measure 14 x 14" and are designed with professional engineers and artists in mind need that amount of screen space for their professional work. Many of these graphics and lighting tablets enable you to transfer your creations onto a computer hard drive either wirelessly or through a USB port. 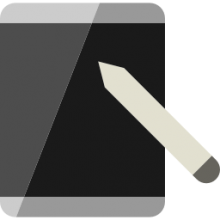 Another differentiating factor between the different writing tablets out there is the quality of the pressure sensitivity of the drawing surface. You want to have at least 512 levels of pressure sensitivity. This will let you do some really interesting effects around line thickness and let you truly mimic the actual feel and function of a pen. Speaking of the included pen, these graphics tablets will also include one, sometimes they are corded and sometimes they are holstered. The last feature that any people look for when purchasing one of these graphics tablets is function buttons on the side of the tablet that let you toggle between applications and perform general actions easily. One mother rights of using her eWriter tablet with her son to do math problems- this saves them a ton of mess and expense buying yellow legal pads. Another user writes of using it with his children to help them with spelling exercises and to memorize class notes. He's a huge fan of Boogie Board eWriting tablets, but he does note that an earlier model needed to be replaced because of contrast fading which made it almost illegible to read. If you are looking to purchase an LCD writing tablet or eWriter, read our reviews above and peruse our Boogie Board comparison table to get a sense of the best options on the market today. These high-tech tablets are inexpensive and fun ways to go paperless. They encourage collaboration and boost the comprehension abilities of those who use them to take notes in academic settings.